Whisk chickpea flour, yoghurt, salt and water together in a medium bowl, set aside. Heat 2 tablespoons oil in a large skillet over medium-high heat. Add mushrooms and cook until browned and fragrant, about 5 minutes. Add onions, zucchini, garlic, cumin, salt and pepper brown lightly. Deglaze skillet by adding wine and lightly scraping bottom of pan to loosen all the brown bits. Add tomatoes with liquids and rosemary. Reduce heat to medium-low and let simmer, stirring occasionally, until most of the juices have evaporated, about 15 minutes. Meanwhile, swirl 1 teaspoon oil in an 8” nonstick skillet, or crêpe pan if available. Wipe pan with paper towel so there’s just a sheen of oil coating the skillet, heat on medium-high. Whisk flour mixture to loosen, pour 1/3 cup into skillet. Immediately swirl to coat pan with batter and cook until bottom is browned, about 1 minute. Flip and cook 30 seconds more. Transfer to a plate and cover with a clean towel to keep warm. Repeat with remaining batter, using greased paper towel to prepare pan before each. The batter can yield 11-12 crepes. 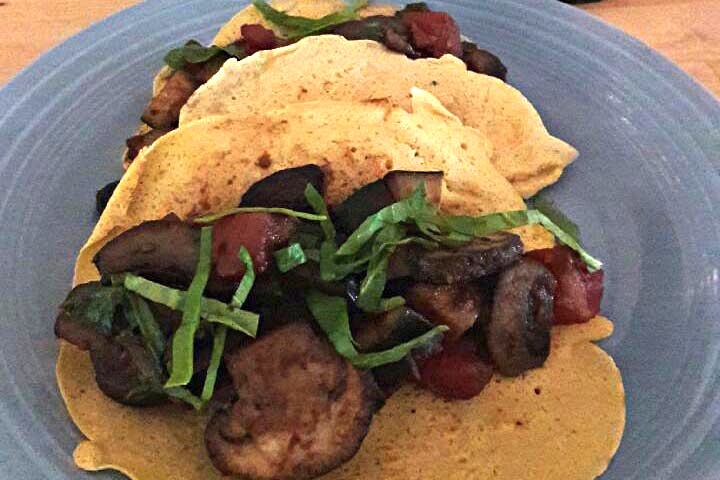 Serve spoon mushroom filling onto crêpe, top with greens. Enjoy with a delicious bottle of CSM 2014 Mourvèdre!